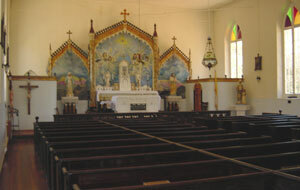 Historic St. Anne's Catholic Church was the first brick church built in California. Built in 1856, it has been restored several times, keeping the original character enjoyed by the minors during and after the gold rush. Walk up the marble stair to enter into their simple, but beautiful house of worship. Step back in time to sit in the narrow wooden pews and enjoy the celestial angels painted by James Fallon as the backdrop of the altar. Ring the bell that called the faithful to prayer. The church perched on the top of Kennebec Hill overlooks the town of Columbia and the State Historic Park. The grounds include the cemetery where the parishioners have been laid to rest. Two giant cypress trees stand guard over the entrance to the cemetery. Half hour tours for school classes are available Monday through Friday, 10am to 3pm. 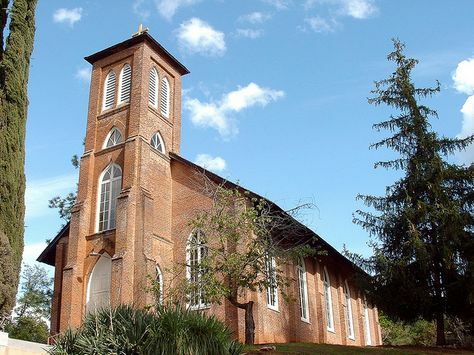 A docent will bring to life the history of St. Anne's Church. Please contact Judy Wilder, 209-532-9422 or Marcia Watts, 209-533-3662 for further information and/or to arrange tour date and time.